Our very own Dimitri is hosting and teaching two Latin workshops this summer on Sunday, July 29th and August 5th from 4:00 – 7:00 PM. Workshop spots are limited so, please call us to register as soon as possible. During this 1.5 hour workshop, we will work on advanced variations, understanding energy, double spins, shaping and leadership. All levels are welcome to attend. Rumba workshop will take place on Sunday, July 29th & August 5th from 5:30 – 7:00 PM. 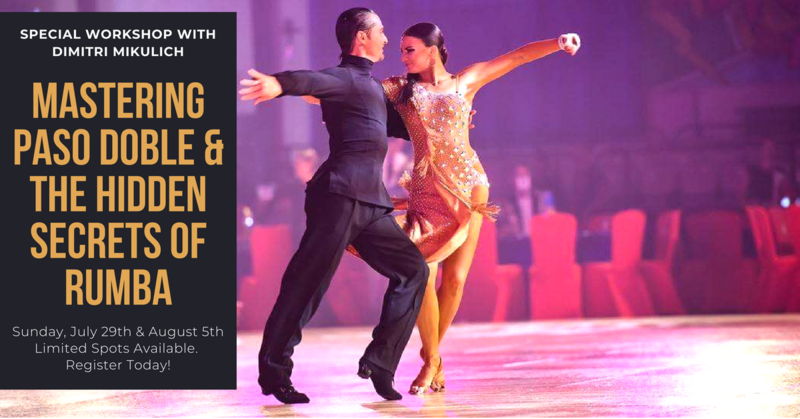 During this 1.5 hour we will be working on advanced hand styling and leg actions, body leads and understanding Rumba rhythm.